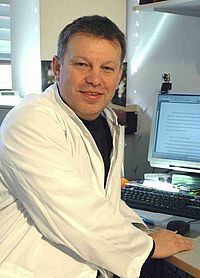 Dr. Jan Kremers is Professor for experimental Ophthalmology and Head of research group Retinal Physiology of Glaucoma at the Deptartment of Ophthalmology, University of Erlangen-Nuremberg in Germany. A comparative approach. John Wiley and Sons. Progressive cone dystrophy with deutan genotype and phenotype. Graefes Archive for Clinical and Experimental Ophthalmology, 244: 183-191. The spatial extent of lateral interactions in flicker perception. Vision Research, 47: 16-21. Linking lateral interactions in flicker perception to LGN cell responses. J. Physiol, 581: 1083-1100. Dendritic thickness: a morphometric parameter to classify mouse retinal ganglion cells. Braz. J. Med. Biol. Res., 40: 1367-1382. Spatial receptive field properties of lateral geniculate cells in the owl monkey (Aotus azarae) at different contrasts: a comparative study. Eur. J. Neurosc., 26: 992-1006. Multifocal electroretinographical changes in monkeys with experimental ocular hypertension: a longitudinal study. Doc. Ophthalmol., Accepted. The Photopic Negative Response of the Blue-on-Yellow Flash-Electroretinogram in Glaucomas and Normal Subjects. Doc. Ophthalmol., Accepted.